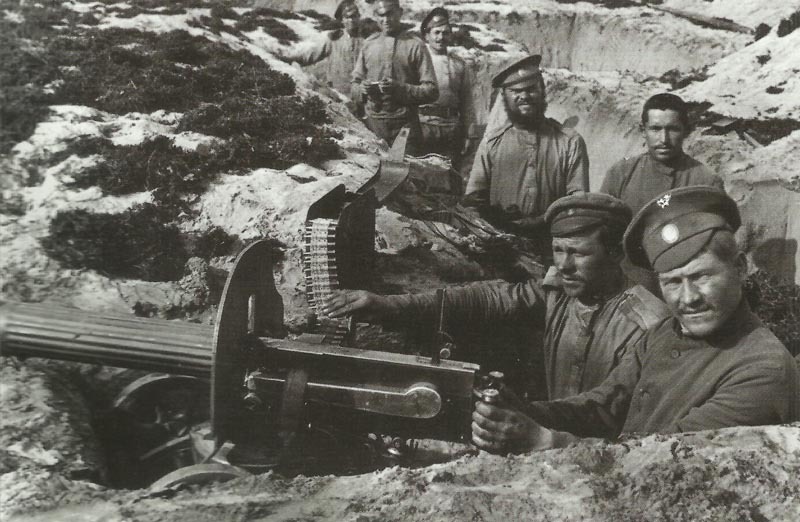 A Russian position with M1910 ‘Sokolov’ Maxim machine-gun and crew. The gunshield protecting the firer war not a common design feature. Galicia: Mackensen attacks Brusilov’s Grodek line along 40 miles and forces retreat. Mackensen takes Zolkiew and Rawaruska (June 20). Artois: French gains near Souchez (and on June 28). Alsace­: French enter Metzeral and bombard Munster. Royal Naval Africa Expedition sails for Cape Town. France: Boulogne Conference of Lloyd George and A Thomas, French junior War Minister. Germany: Socialist manifesto calls war no longer defensive, cannot be supported.